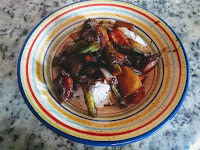 This is a easy spicy Asian shrimp, chicken, or pork dish with vegetables served over Jasmine rice. You can change up the ingredients to use your favorite proteins and vegetables. The first time I made this, we had it with shrimp and it was fabulous. The second time, we had it with chicken, asparagus, green beans, sliced carrots, sweet peppers and onions. Again, it was delicious. 2 cups of mixed sweet peppers cut into 1/2-inch dice. Use yellow, red & green pepper for color. Whisk soy sauce, hoisin sauce, honey, chili puree, and pineapple marmalade together in a bowl. Stir shrimp into the marinade; refrigerate for one hour. Add the Jasmine rice to a medium saucepan with high heat and cover the rice with 3 cups of boiling water. Cover the saucepan and lower the heat to a slow simmer for 20 minutes. Do not remove the lid. Turn off the heat to the rice and let it rest with the lid on for another 15 minutes. Heat the olive oil in a large skillet or wok over medium-high heat. Cook the vegetables in the oil until they just start to soften, 2-4 minutes. Add the shrimp with all the marinade, and the garlic, ginger, and sesame oil into the vegetables. Sauté just until the shrimp is pink and cooked through, about 4-5 minutes. Serve over hot jasmine rice, sprinkled with sesame seeds and cilantro. 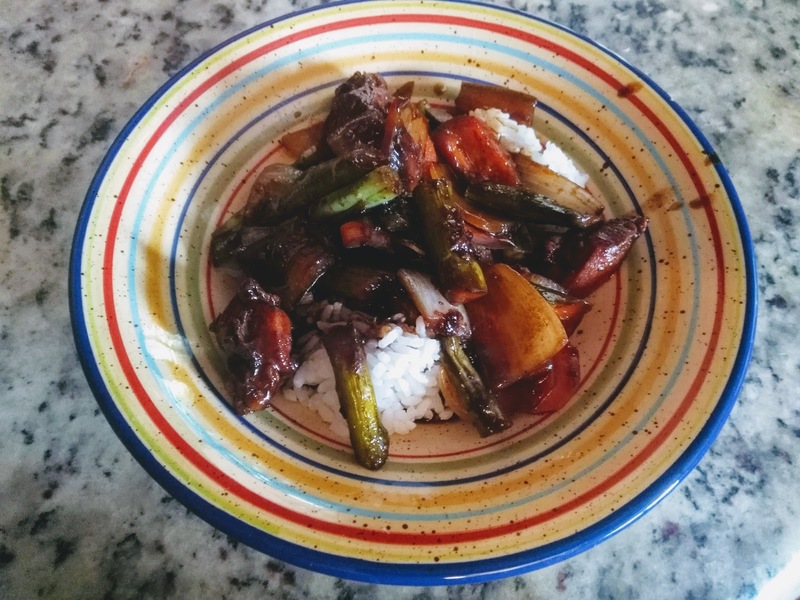 Note: This recipe is very versatile and you can change it up to use different vegetable and proteins like sugar snap peas, leaks, bok choy, cauliflower, diced chicken or pork.